BlueStacks is a great software to enjoy the mobile games on PC. And it is the Best Android Emulator as well. But one bad setting in BlueStacks can ruin your gaming at first place. You know why? Because it’s not a normal software, its engine that needs decent requirement to run on any PC and that’s why you should Customize BlueStacks for Best Gaming. And if you don’t do that then the lags can kill your gaming. So, in today’s post, I will give you some settings guide that ensure good performance on any PC while running BlueStacks. Before getting to those best settings, I want you to know some features about the latest BlueStacks 4 which recently launched for better gaming in PC. And Also, explain to you why you need BlueStacks 4. So, let’s get started. 0.1 What’s New in BlueStacks 4? 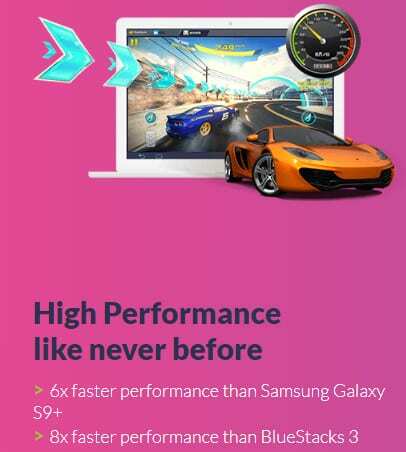 According to official BlueStacks, it is 6x faster than Samsung Galaxy S9+ and also, it is more simple than any Android emulator out there. High Performance Like Never before. New and Improved Key Mapping. BlueStacks Store and BlueStacks Points. Now let me briefly break down these! In BlueStacks 4, the performance level has increased more than 8% than BlueStack 3 that was the previous version of BlueStacks. Also, the performance of BlueStacks 4 is 6x faster than Samsung galaxy s9+ which is the best high-end device in 2018. Meanwhile, the performance of BlueStacks for is better than any Android device available right Now. And it also becoming more compatible with PCs. While playing PUBG (the most popular shooting game of all the time) on BlueStacks 4, the performance doesn’t degrade. But if you play PUBG PC version on your computer or laptop then it will definitely lag with decent specs. And that’s the power of BlueStacks 4. The UI in BlueStacks 4 is as simple as reading books in a well-known language. 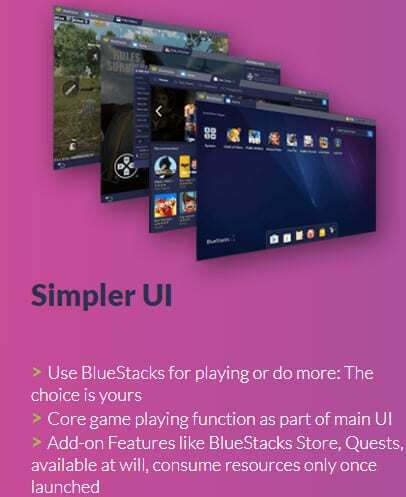 And this simplicity makes BlueStacks 4 to Run flawlessly on any PC or Laptop. With simpler UI you can Play more and do more. Means the capability of playing games with simpler UI of BlueStacks 4 has increased. You can play any High-end games like PUBG or Asphalt 9 legend with BlueStacks 4 because the simpler UI is now part of the core game playing function. Moreover, you can add more feature of BlueStacks like BlueStacks store, Quests, available at will, and it the game consume resource once its launch. Simpler UI is pretty good for advance and comfortable gaming because it prevents lags, hangs, and give more performance. BlueStacks 4 has well-improved Key Mapping function. All the Control are now truly in your hands. Controlling games with BlueStack 4 has improved as of now. Even more, you can customize your own controls for Particular game and its all due to the new and improved key mapping function. 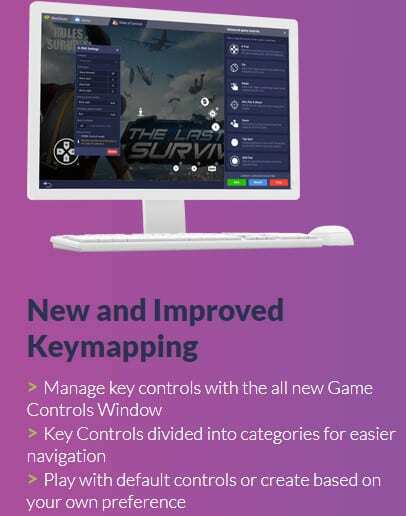 The key mapping on BlueStacks 4 is categorized in a user-friendly way. Means you can easily navigate through without any issue and problem. This new key mapping function is now available for all the new games. So, you can customize your new PUBG game controls easily on BlueStacks 4. 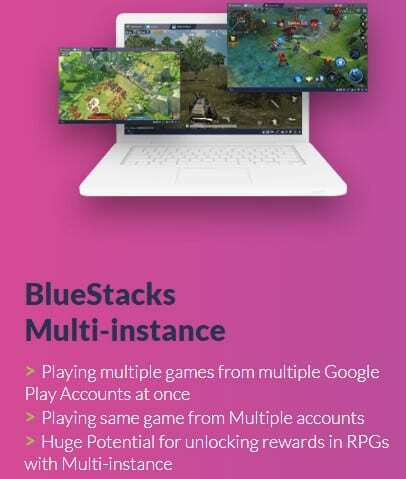 Multi-instance of BlueStacks 4 allows playing multiple games at the same time. And to do that, you need to have multiple Google accounts on your BlueStacks. Even you can play the same game with multiple accounts. Its just best for two brothers who love one particular single game but doesn’t have two devices. Multi-instance is a really good feature for Solo loving brothers. And it also has the capability to improve RPG’s game unlocking rewards. It is really a good feature for gamers who love RPG’s games. Love achieving targets? Earn points and get a free gift is a big feature for those who are looking to get the reward of their hard time spent on gaming. You can get rewards by exchanging your points with gifts. These exchange can be done using Bluestacks store. 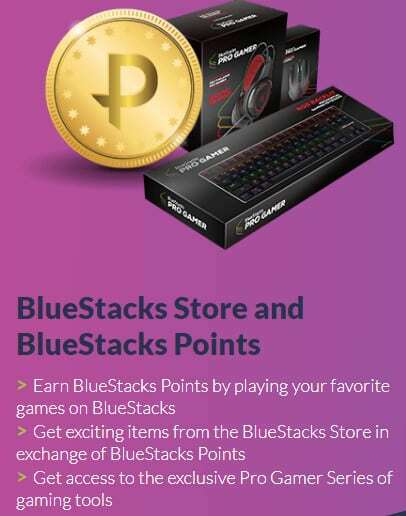 You just have to visit the BlueStacks Store, make an account and exchange your points with rewards. All the gifts that are listed on the BlueStacks store have points mentioned. So, when you reach that exchange point, make sure to check out your reward. This is something very good In BlueStacks that everyone should Try. Its really offering a valuable deal. Just play the game, earn points through and check out your rewards. That’s it. And with this feature, you don’t have to worry about your gadget for gaming. Because you will earn it by just playing your game. So, these are some good new feature that BlueStacks 4 have. Now, you may be thinking about download And installing it on your PC. Right? If so, then please let me guide on it because there are some critical things that you gonna face on the way. Visit the BlueStacks official website. Do you know that BlueStacks has its own official site that contained a huge amount of information about it? Okk! Now you know so, from there you can take any knowledge about it without any restriction. Look for download buttons and click on it. It usually found on the top or sometime in the middle. It shifts sometimes so, make sure you look everywhere in the page for Download buttons. Click on final Download button and catch the file. This is the final action you have to make to get the BlueStacks installation file. After you catch it in your browser, just for 10 minutes to successfully download it. Before installing, make sure you have installed Microsoft Netframe worker in your PC or laptop. Microsoft Netframe Worker is necessary for BlueStacks Android emulator to run On PC. It usually helps the BlueStacks engine to run properly and smoothly. Disconnect internet connection and double click on BlueStacks.exe file to install it. This is so important because sometimes BlueStacks try to connect to its server to check the version. And if the version if low, it recommends getting the latest version. Well, this is very useful but not for all. It actually increases the load on CPU and RAM that immediately degrade the PC or laptop performance. Select BlueStacks file destination carefully. BlueStacks is a very high-end software that requires a good amount of Space. And you can take advantage by selecting the disk on your computer that has the most amount of space. Later, it will help BlueStacks to install and run the application, games easily. Hit the install button and get the shortcuts on your desktop. This is the final step to get completely install the BlueStacks on your computer. The complete process may take some time (it totally depends on the specs of your machine). You have to be quiet there and please don’t do other tasks in background. Because sometimes the installation stucks at the middle or near to end. Also, doing other tasks while installing BlueStacks, slow down the process of installation. Just click on the Finish button and end the installation process. Now you have done the full installation process in a very good way. Now, you are about to play your best Android game on BlueStacks. But wait! Are the default settings is best for your PC or Laptop? Absolutely not! Yes, in some PC’s or laptop’s the default settings is Okk but not in all the PC and laptops. So, how do you know which settings of BlueStacks is best your PC or Laptop? There is no way on the internet except here! I will give you every best setting of BlueStacks for your PC. How? Let me explain! So, in the settings, there are numerous option to customize like display, engine, and more. But you only have to focus on two settings that I just mentioned in the previous line. Its display and engine. Now, let me give you the Best Bluestacks settings for your PC or laptop. I understand that having a Low-end PC is a disadvantage when talk comes to gaming in BlueStacks. But in this world we are living in is everything impossible. So, the point is how you can play Android games on BlueStacks on your Low-end PC! This can be done by reducing the BlueStacks quality by accessing its settings. Reducing the screen size of BlueStacks will deliver you more FPS that helps your PC to run games smoother. Now you have a question that how you can know the Aspect Ratio for your Low-end PC. Well, after looking and experimenting on a ton of factors, I come to the end that BlueStacks at 640*480 Ratio screen performs better. You can also play games on BlueStacks at 1280*720 ratio screen. But it’s not better than 640*480 screen. So, now you know the best screen ratio for Low-end PC. Now let me show you how you can change the BlueStacks display aspect ratio. Do right click on the BlueStacks icon. Checkmark the “Run in 640*480 Screen Resolution”. Hit apply and OK to save the setting. Now, you have been successfully changed the screen resolution of BlueStacks to the best screen for Low-end PC. If you feel the steps are a little hard to follow then you can continue your reading for another way. Wait for the engine to start. Go to settings from top right. In display settings, choose a Custom size option and enter 640*480 size OR select 1280*720 screen resolution. Press “Enter” and restart the BlueStacks. This one is the simplest way to change the screen size of BlueStacks and improve gaming performance. 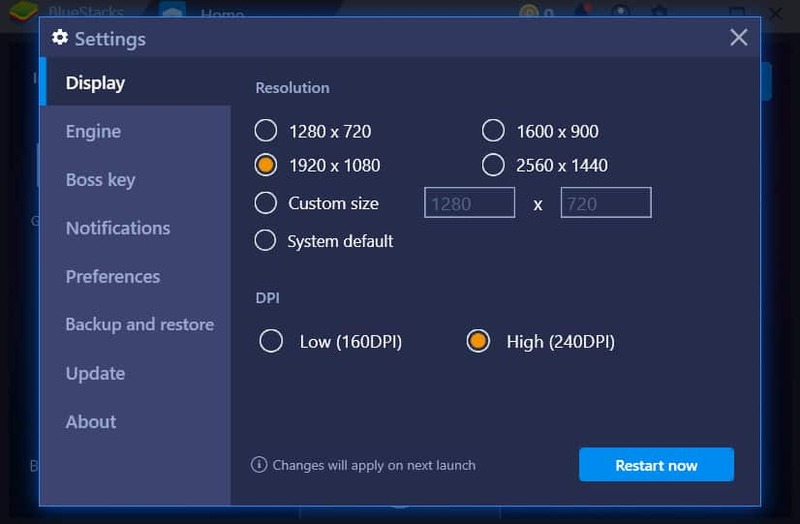 You can Also reduce the DPI to 240 for best performance. I highly recommend setting the DPI to Low. Remember sometimes, it Un-changeable! So, try it also but at your own risk. The Engine of BlueStacks is the most powerful engine that ever built for Android gaming. It built for delivering good gaming performance and it might be optimized by default. But still, there is an option to improve it too. And you should take advantage of it for improving the gaming performance of BlueStacks on your Low-end PC. Again, I experimented many settings on the engine on my Low-end PC and the outcome is so amazing. So, optimizing the engine will overall improve the gaming performance on your Low-end PC. Basically, there are multiple factors that you should remember while playing with the engine. Reduce that usage or giving fewer specs access to the engine may lead to BlueStacks failure. So, I recommend reducing it to medium or normal. In Engine, there are many elements like Graphics Mode, CPU and RAM allocation. These three things can define the BlueStacks performance on your PC or Laptop. So, If you have Graphics (integrated or external) then you can go with OpenGL setting. But if you don’t any good graphics then you should go with DirectX setting. Now, assuming graphics section is well clear to you. Isn’t it? This will give your PC a Boost in BlueStacks and You will be able to play games like Subway Surfer and Temple Run. Not PUBG! To play PUBG, you should allow BlueStacks to Use at least 2 GB of RAM and 4 Cores. Use these settings on your Low-end PC or laptop and you will see an instant boost while playing Android games on BlueStacks. Now, let me give you the best settings for High-end PC and Medium-end PC. High-end PC owners will face no issue even in default BlueStacks settings because their specs are good Enough as recommendation specs of BlueStacks. But still, you can take advantages to improve the BlueStacks performance with its settings. Now, let me show you the best BlueStacks settings for your High-end PC and medium end PC or laptop. Changing the display and engine settings at best can increase the gaming performance on BlueStacks in your High-end PC. The above-mentioned screen size and DPI is the best display settings for High-end PC. 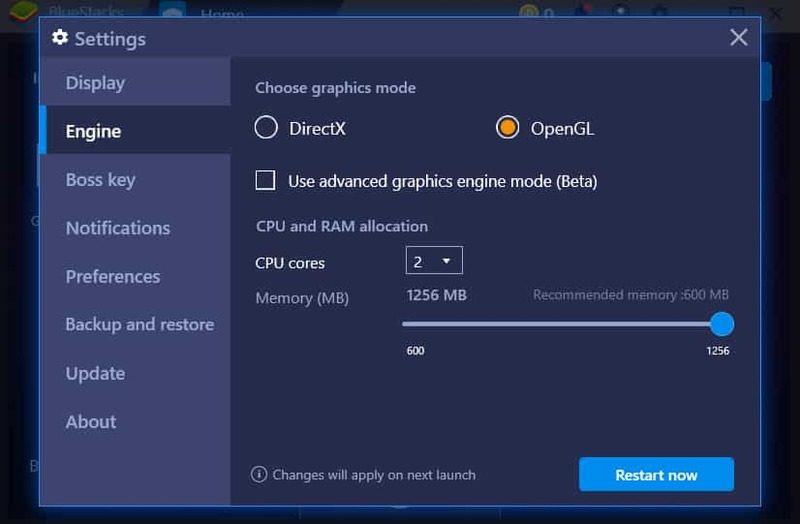 Use OpenGL instead of DirectX, if you have graphics on your Computer. You can also use advanced Graphics Engine mode for better gaming. Set CPU cores at 6 or higher if you have and set RAM allocation to 4 GB or Higher if you have more. The above-suggested settings are the best working settings of BlueStacks for High-end PC or Laptop. These are the simple and best working settings you can do right now to enhance the BlueStacks gaming performance on your High-end PC. Now let me show you the best settings for medium-pc or Laptop. Medium-end PC or laptop has at least faith to Run any Android Game and that Low-end PC owners don’t have. So, it will not be hard to Play Android games with BlueStacks on medium-end PC. Let me show you the best display and engine settings for Medium-end PC or Laptop. The above-mentioned display and DPI size is the best working screen size for BlueStacks. It can improve the gaming performance at least 3x. Go for OpenGL, if you have graphics installed. Use 4 cores or more if you have. Set RAM allocation Memory to 3 GB or more if you have. These engine settings are the best working settings for Medium-end PC or laptop user. Low-end PC or Laptop users should be willing to immediately change to the suggested settings for better gaming on BlueStacks. High and medium PC owners should play in quality because they already have good specs that enough for BlueStacks. But still, you can do some tweaks and play with advanced graphics mode to enhance the performance. Overall, the settings I suggested works awesome and I tested in real. So, there is a strong chance that it also works for all of you. Hope you got learned something good about BlueStacks gaming. If so, share this at least to your BlueStacks lover and help them to maximize the BlueStacks performance for better gaming.